They say the way you start the morning often sets the stage for the rest of the day. Here’s how I used to start my day: with a bowl of nutri-grain cereal. In my naivety, I believed the marketing messages that this was the food of iron men and women. I believed it would help me power through the school day like a champion. Then one day it hit me: This sugary cereal wasn’t making me stronger or sharper like a disciplined athlete. At 32 grams of sugar per 100 gram serve (that’s a staggering 32% sugar), it was creating a fog in my brain, messing with my mood and predisposing me to type 2 diabetes and obesity. So a few years ago, I decided to make a small change to my breakfast routine. I started to make my own muesli. All ready to make a big batch of muesli. 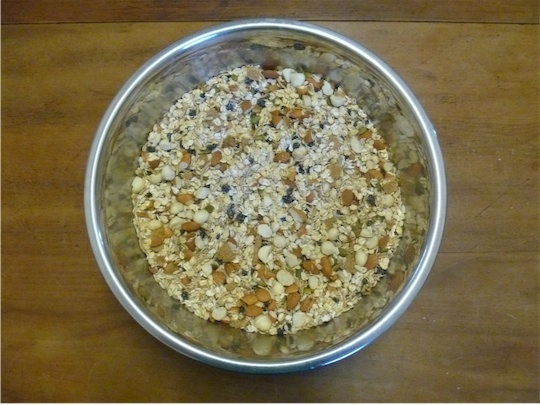 What struck me was just how easy and cheap homemade muesli was to make. It was also surprisingly delicious. Powered by homemade muesli, I noticed that my thinking sharpened. My mood became steadier. The quality of my whole day improved. And here’s the thing: you can have this too if you start the day with a wholesome breakfast. I hear students say this all the time. “Why eat breakfast when you can sleep in for another 30 minutes?” they say. Studies have also found students who skip breakfast don’t do as well on tests and exams as other students. Why? For the simple reason that their brains aren’t functioning particularly well. You don’t have to be a fantastic cook to prepare healthy, quality breakfasts. 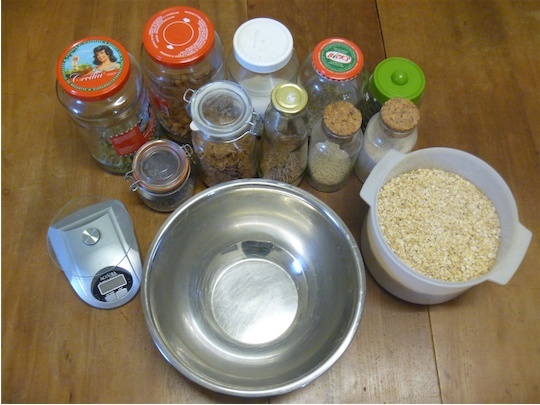 Once I mastered muesli making (and it’s pretty easy to master!) I started to experiment with other homemade breakfasts. The breakfasts I routinely make are quick and easy and require beginner level cooking skills. I don’t make beautiful looking meals that you’ll find in glossy food magazines. I don’t have the time, energy or patience for that. What matters most is that my meals taste good, are packed full of nutrients and leave me with a clear mind. Throw these ingredients in a bowl and stir around. Store in a container. A double batch of muesli (this will last me about a month). If you buy these ingredients in bulk it will save you time and money. You don’t have to spend $20 at a café to enjoy a delicious cooked breakfast. For very little money, you can make your own. 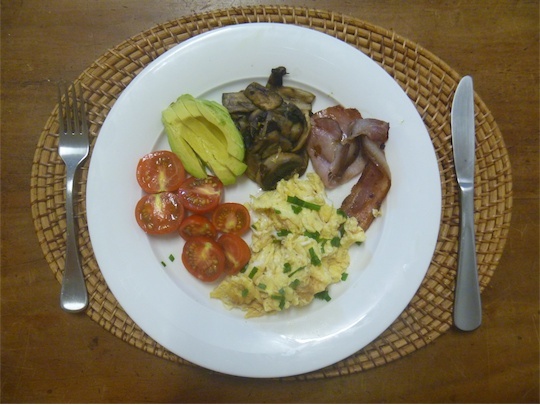 My home cooked breakfast: so simple and delicious! You may have noticed that I don’t have any toasted bread with my cooked breakfast. The reason is bread makes me sleepy. You want to start to tune into your body and notice how certain foods make you feel. Tailor-make your breakfasts accordingly. If you don’t like the idea of breakfast or you’re in a rush, then start with a simple smoothie. Take your smoothie ingredients. Place in blender. Press button. Done. 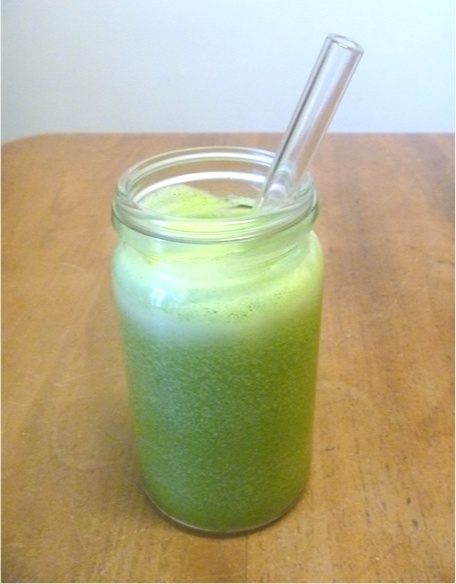 A green smoothie packed full of micro-nutrients. I find the key to making a good smoothie is to adhere to the basic principle of less is more. If you use a few quality ingredients, it usually tastes pretty good. Throw in too many different fruits and vegetables and you may end up with a grey looking sludge of a smoothie. So keep things simple! Ingredients: 1 cup of freshly squeezed orange juice, 1 apple, 1 lime, half an avocado, 10cm piece of cucumber, small bunch of spinach, handful of mint leaves and some ice-cubes. Ingredients: a handful of almonds, 200 grams of water, 1 tablespoon of cacao powder, 1 frozen banana (cut into chunks) and 1 tablespoon of chia seeds. Top with cacao nibs (optional). Note: If you are hungry after school, smoothies are a great study snack! This one sounds fancy and looks like a lot of fuss, but it’s actually really easy to make. This looks more like dessert than breakfast. What’s going on?! Mix the oats (1 cup), seeds (1 tablespoon of chia seeds, 1 tablespoon of pepitas and 1 tablespoon of sunflower seeds), spices (1.5 teaspoon of cinnamon and half a teaspoon of nutmeg), maple syrup (1 tablespoon), vanilla extract (half a teaspoon) and milk (1 cup). Cover and let it sit in the fridge while you sleep. 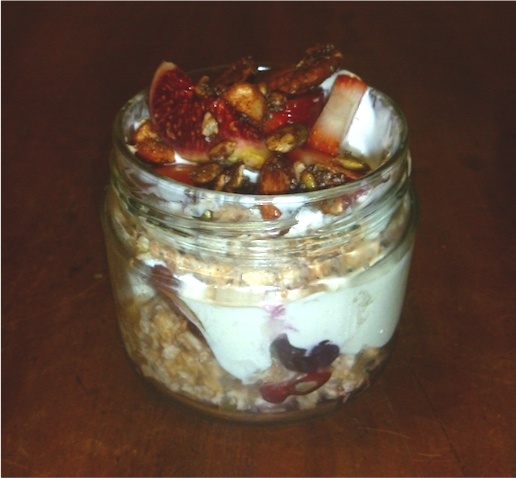 In the morning, grab a jar and create layers of goodness: a layer of oat mix, followed by some natural yoghurt, a layer of chopped up fruit (whatever is in season), a layer of oats, some more yoghurt and some more fruit. Note: This makes 2 serves. So why should you bother making your own breakfasts? Because it’s an investment in your mind and body. With a clear mind, you’ll be able to operate at your full potential. You’ll be more present. You’ll feel calmer. You’ll look better and feel healthier and happier. Often it’s the little changes we make to our lives that have the biggest impact. When I cut out nutri-grain and started eating my homemade muesli, I experienced an immediate difference in the way I felt. 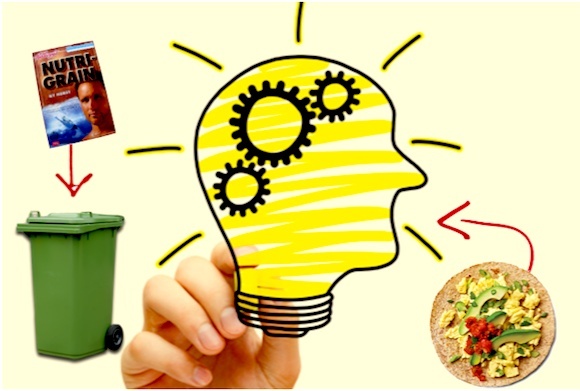 So why not experiment and see what kind of difference having a wholesome breakfast has on your life?